I had a chance at the SXSW Interactive Conference this week, to attend an introductory session on how the principles of the martial art of Aikido can be applied to resolving workplace and other conflicts. The presenters used the symbols of sword, shield and withdrawal to illustrate three basic ways of initiating or responding to conflict. 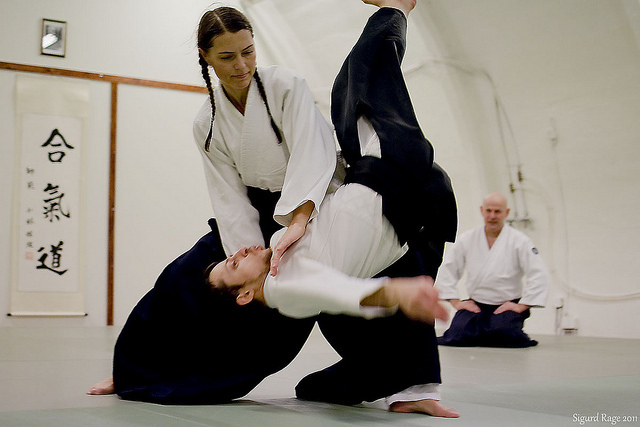 For example, someone pushing toward your center can be met with a counter-thrust, or a block, or by running away. When we practiced learning how to recognize these attacks and responses, it almost felt like a game of rock-paper-scissors. Our choices might be dictated by our own instinctive approaches to conflict, or by our perceptions of what would work best against our opponent. Aikido teaches a more advanced technique than these limited fight or flight instincts would allow. That is to embrace the energy of one’s opponent and channel it in a new direction that perhaps neither side originally expected, but that both sides “agree” on. I couldn’t really learn how to do this in one introductory session, but did get a little sense of how this feels. Instead of escalating the fight with one’s opponent, by responding with your own hostile actions, what you are doing is turning your adversary’s intentions in a more peaceful direction. What was fascinating, however, was the presenters’ illustration of how this technique might be used in a workplace interaction. Say your boss calls you on the carpet for a poor report you presented. You could respond by defending your work (shield), or by attacking the premise of the assignment (sword), or by hanging your head in shame (withdrawal). More effective than any of these traditional responses might be to thank your supervisor for his criticisms and ask for suggestions for improvement. By doing that you would be channeling the energy of your supervisor in a new direction that neither party may have anticipated (and in the process you might also avoid getting fired). This sounds to me a lot like what we teach in negotiated conflict resolution. The most enlightened methods to achieve a consensual resolution do not rely on arguing with the other side about the validity of their contentions, or denying their claims, or running away. Instead, a good negotiator will try to understand–and even embrace the contentions made by the other side, to the extent they can without harming their own interests–and then attempt to channel those ideas and interests in a harmonious direction. A process has to be worked out among the participants of the conflict to resolve the conflict like sharing knowledge on the subject, listening, accepting the better outcome etc.